Q67. 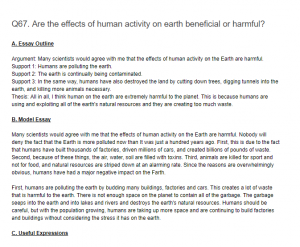 Are the effects of human activity on earth beneficial or harmful? Argument: Many scientists would agree with me that the effects of human activity on the Earth are harmful. Support 1: Humans are polluting the earth. Support 2: The earth is continually being contaminated. Support 3: In the same way, humans have also destroyed the land by cutting down trees, digging tunnels into the earth, and killing more animals necessary. Thesis: All in all, I think human on the earth are extremely harmful to the planet. This is because humans are using and exploiting all of the earth’s natural resources and they are creating too much waste. Many scientists would agree with me that the effects of human activity on the Earth are harmful. Nobody will deny the fact that the Earth is more polluted now than It was just a hundred years ago. First, this is due to the fact that humans have built thousands of factories, driven millions of cars, and created billions of pounds of waste. Second, because of these things, the air, water, soil are filled with toxins. Third, animals are killed for sport and not for food, and natural resources are striped down at an alarming rate. Since the reasons are overwhelmingly obvious, humans have had a major negative impact on the Farth. First, humans are polluting the earth by budding many buildings, factories and cars. This creates a lot of waste that is harmful to the earth. There is not enough space on the planet to contain all of the garbage. The garbage seeps into the earth and into lakes and rivers and destroys the earth’s natural resources. Humans should be careful, but with the population growing, humans are taking up more space and are continuing to build factories and buildings without considering the stress it has on the earth.